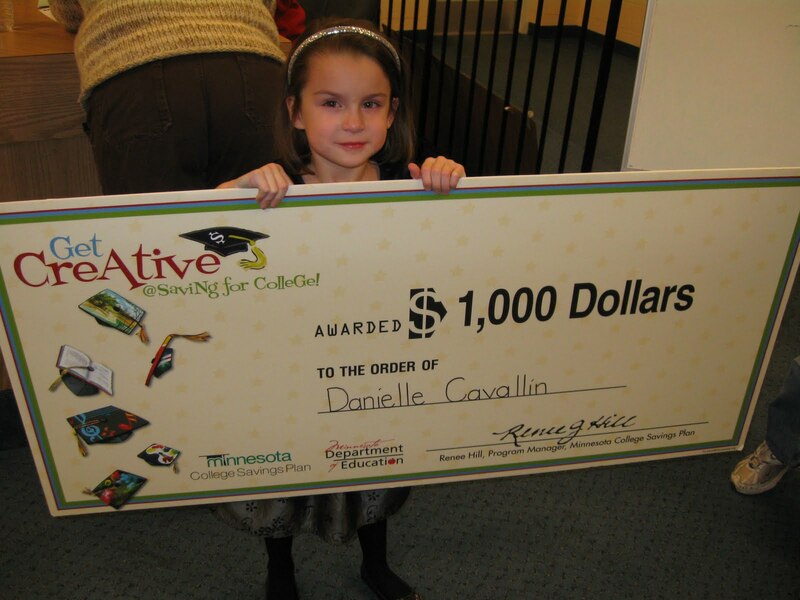 Six year old Danielle Cavallin of Pine City was selected as a winner in this summer’s “Get Creative @ Saving for College” sweepstakes, sponsored by the Minnesota Department of Education, State Library Services and the Minnesota College Savings Plan. Jeff and Jaclyn Cavallin, parents of Danielle, were awarded a $1,000 cash prize that can be invested in a Minnesota College Savings Plan account for the benefit of Danielle. The sweepstakes, which received over 4,000 entries statewide this summer, was a component of this year’s Minnesota Library Summer Reading Program, held at public libraries throughout the state. The Pine City Public Library branch of ECRL where Danielle participated in the Summer Reading Program, also won a $500 cash prize. In total, 15 $1,000 cash prizes were awarded to summer reading program participants in Minnesota. The 15 libraries where the winners participated in the summer reading program also won $500 towards future reading programs. Danielle received her “big” check at the 50th Anniversary Celebration at the Pine City Public Library on Thursday, November 19. Danielle’s entire family was there to help her celebrate.